Welcome to the world of horses through the eyes of Laura Savoy Boyle. Horses are Lauras passion. 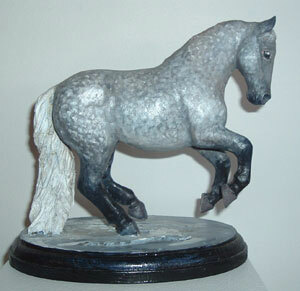 She not only paints and carves these elegant beauties but rides and teaches riding skills as well. 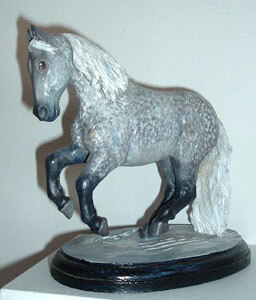 Visit her renovated Studio in the Barn and see her excellent equine carvings, drawings and acrylic paintings. The studio: Some have asked me how I came up with the name Running Paints for my studio. I liked the play on words first of all, and although I dont own a Paint horse, I find them interesting to draw sometimes. To me, Running Paints suggests a freedom of uncontrolled and unbridled creativity, and it allows me to explore and experiment in many different mediums while continuing to grow as an artist. If you look out, you may even see her two horses happily munching on some grass. This is her workspace, and you can come and see a showcase of her newest work for sale, competition pieces in progress, and visit the artist at work. 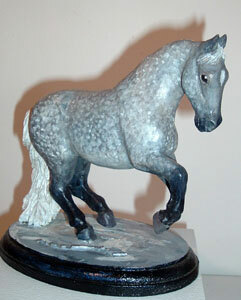 New for this year too, is the traditional rocking horse. 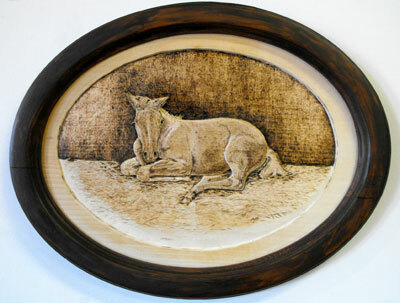 Based on a proven design for stability and function, Laura modified the rocking horses to reflect an earlier time where they were hand carved in more realistic detail. They stand approximately 30 inches high, and 53 inches long. They do not sport real horsehair for their manes and tails, but rather a synthetic substitute so they can still be braided and brushed.